Definition at line 99 of file shobjidl.idl. Definition at line 101 of file shobjidl.idl. Implemented in CEnumNTDirectory, CEnumRegKey, CEnumRegRoot, CEnumIDList, CEnumMergedFolder, CEnumZipContents, and CEnumIDListBase. 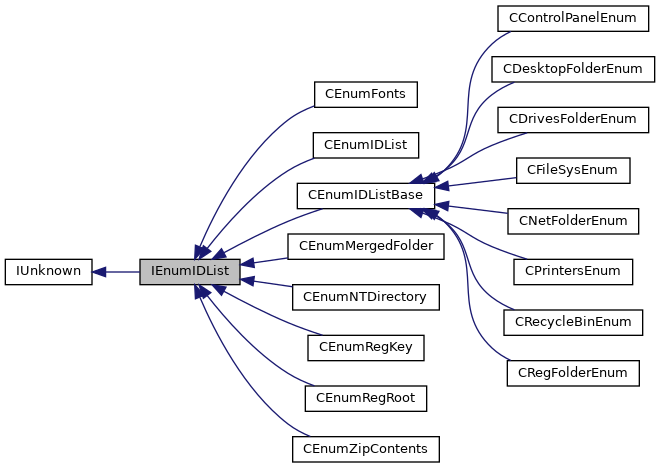 Implemented in CEnumNTDirectory, CEnumRegKey, CEnumRegRoot, CEnumMergedFolder, CEnumIDListBase, and CEnumZipContents. Referenced by CEnumIDListBase::AppendItemsFromEnumerator(), CDesktopFolderEnum::Initialize(), and CCommonFolder< CRegistryFolder, RegPidlEntry, CRegistryFolderExtractIcon >::ParseDisplayName().